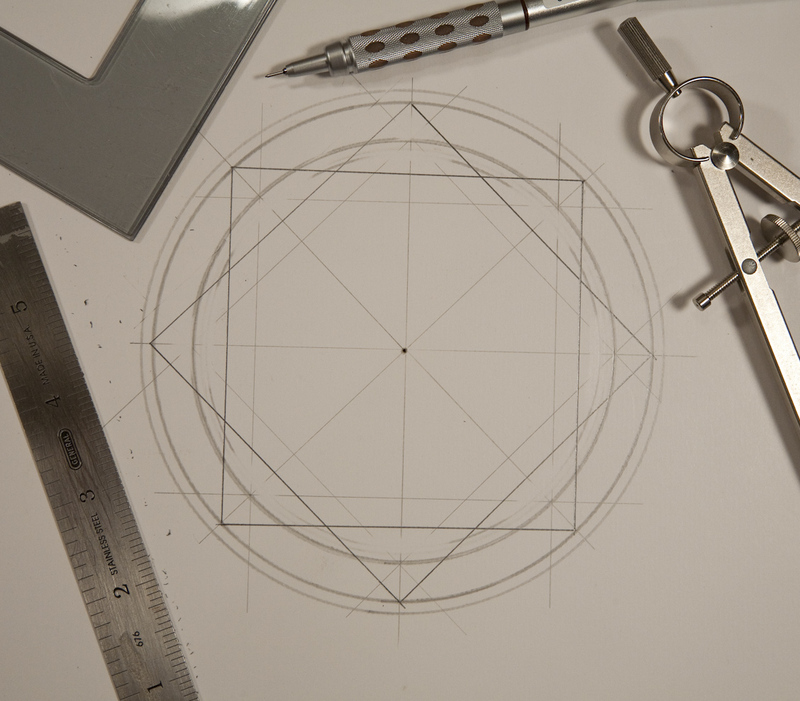 In previous posts you may have noticed a geometric rosette I make for my instruments. 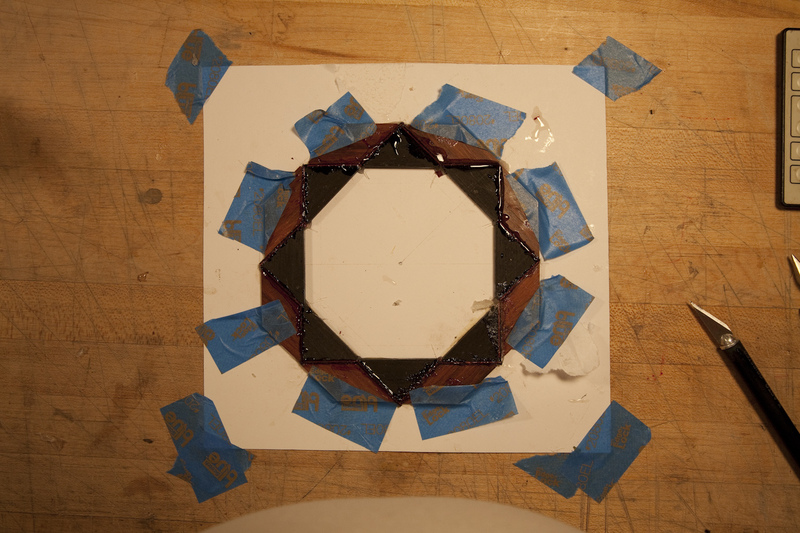 I thought Id show you how I make these through photos. 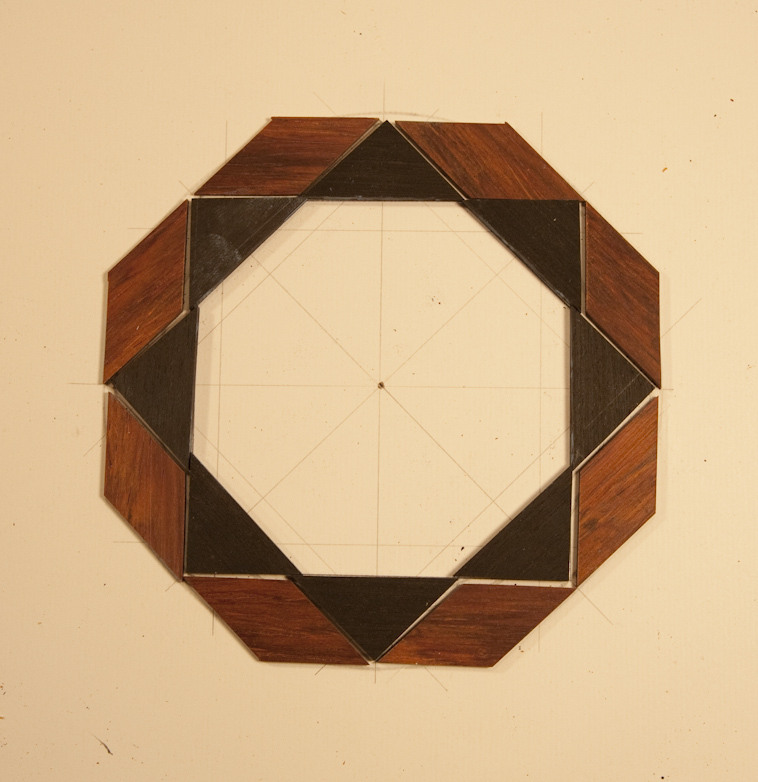 All pieces are laid out in the order they will be installed. 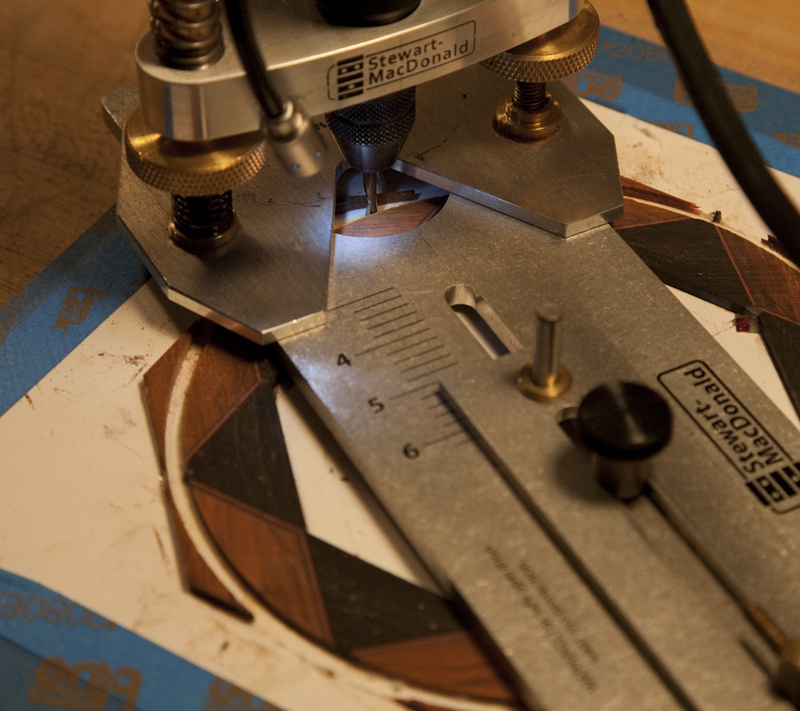 A router base with circle cutter attachment is used to cut the rosette out. This is done with many passes till the paper is reached. Don’t cut through the paper. 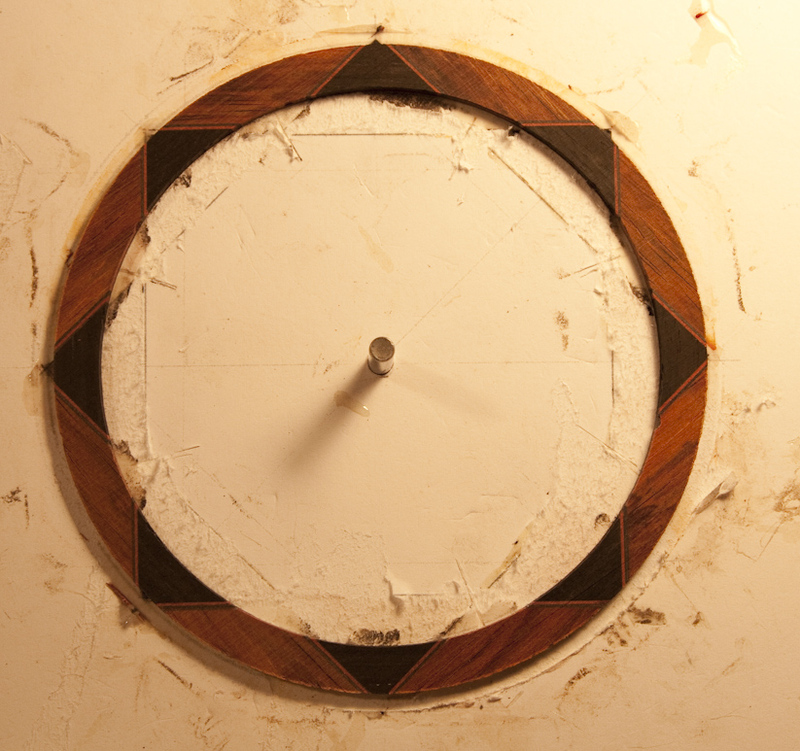 On the outside of the circle move the cutter clockwiset. 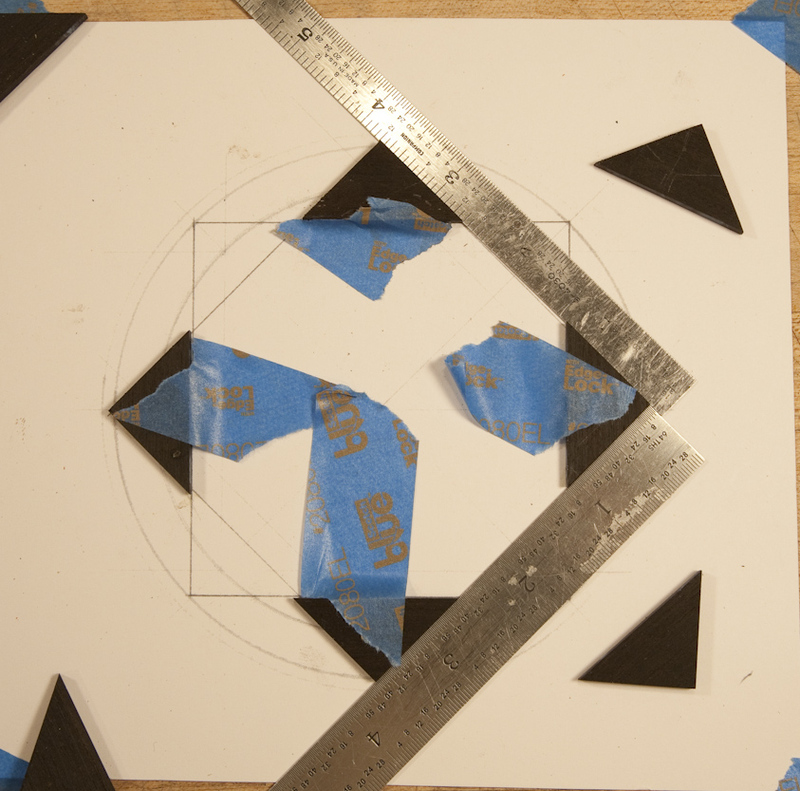 On the inside of the circle rotate the cutter counterclockwise. 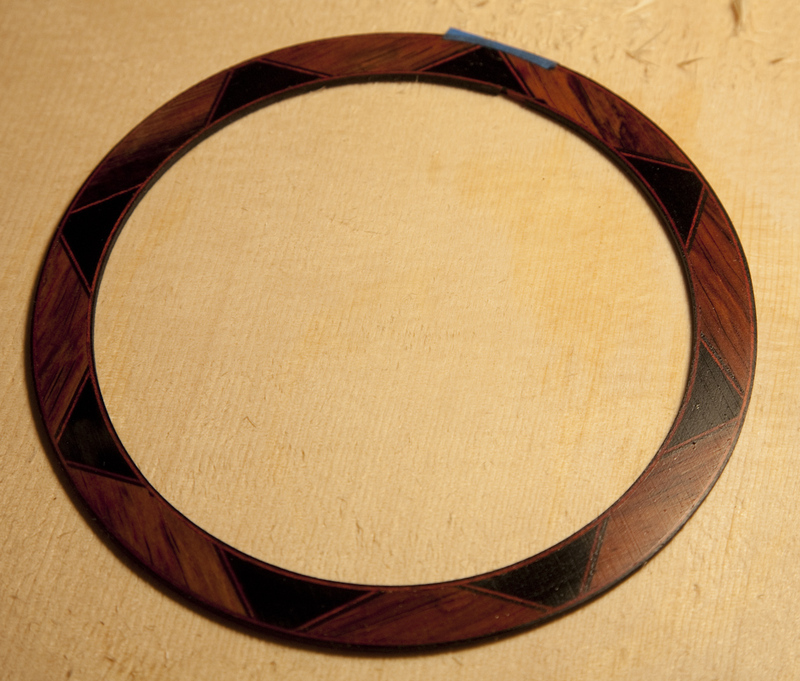 Two srtips of fiber binding to match the pieces between the cocobolo and ebony are glued around the inside. 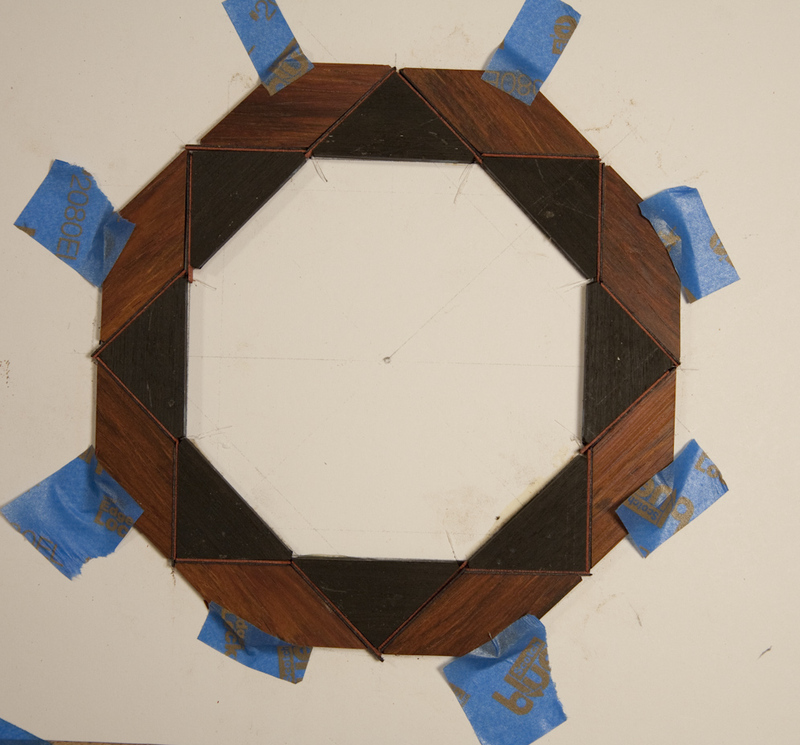 This is decorative and also helps to keep the rosette together. 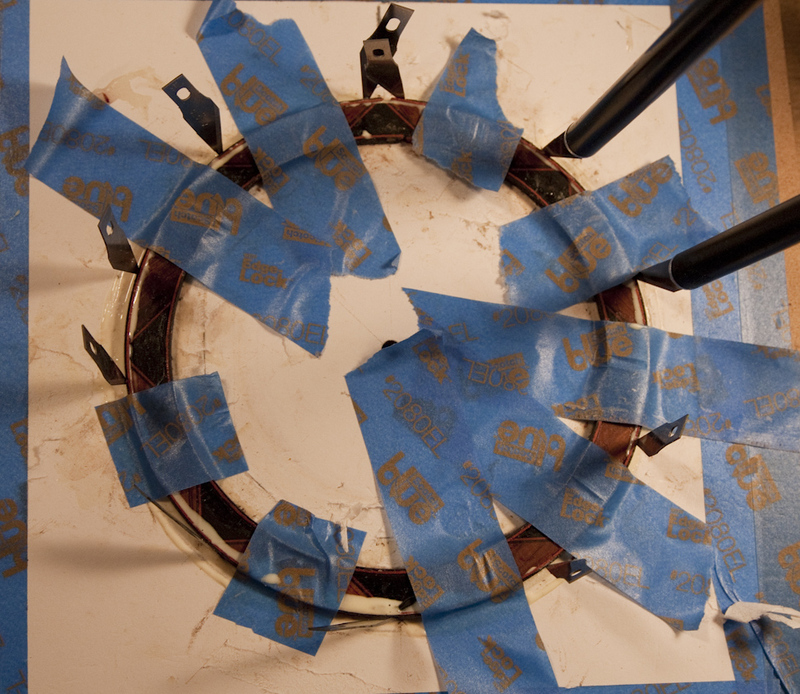 The strips are held in place with tape and Exacto blades while drying. 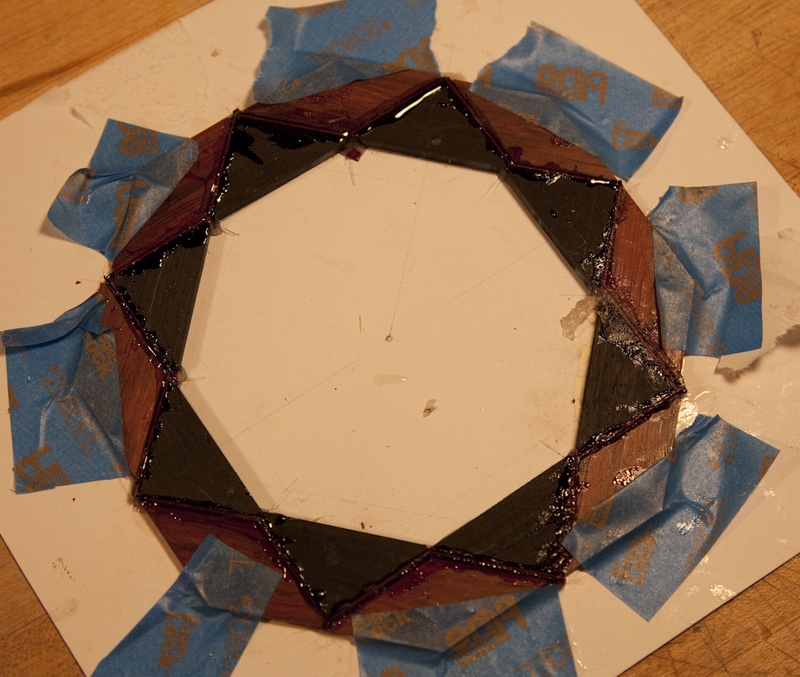 The finished rosette. 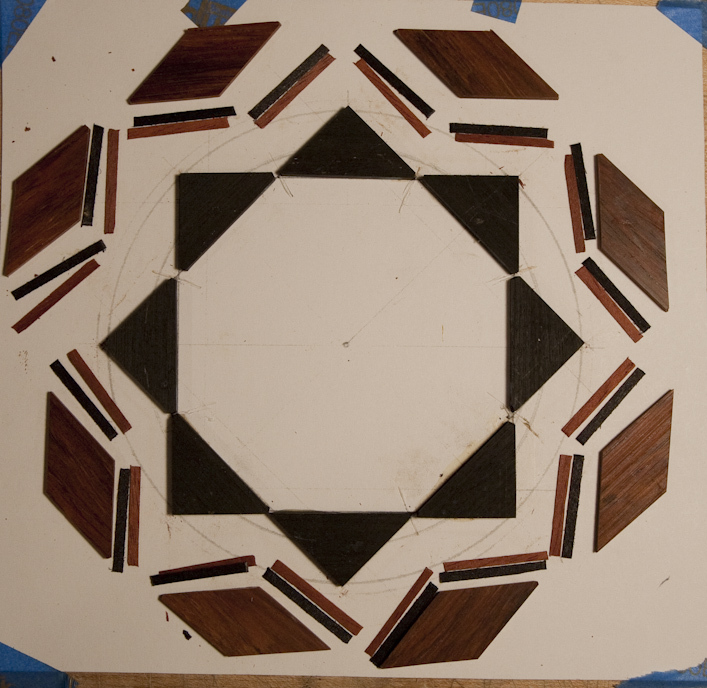 This will be inlaid to the guitar top. 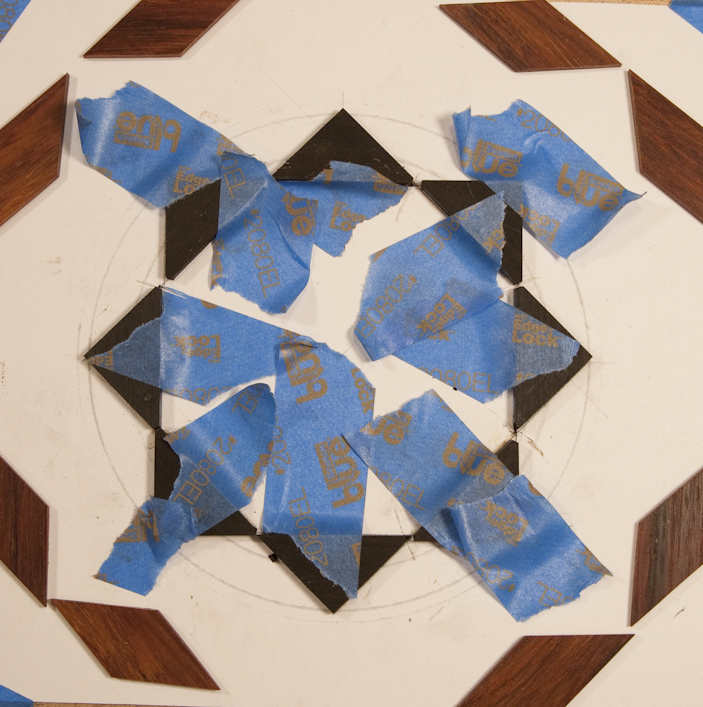 Additional binding strips will be added at installation. 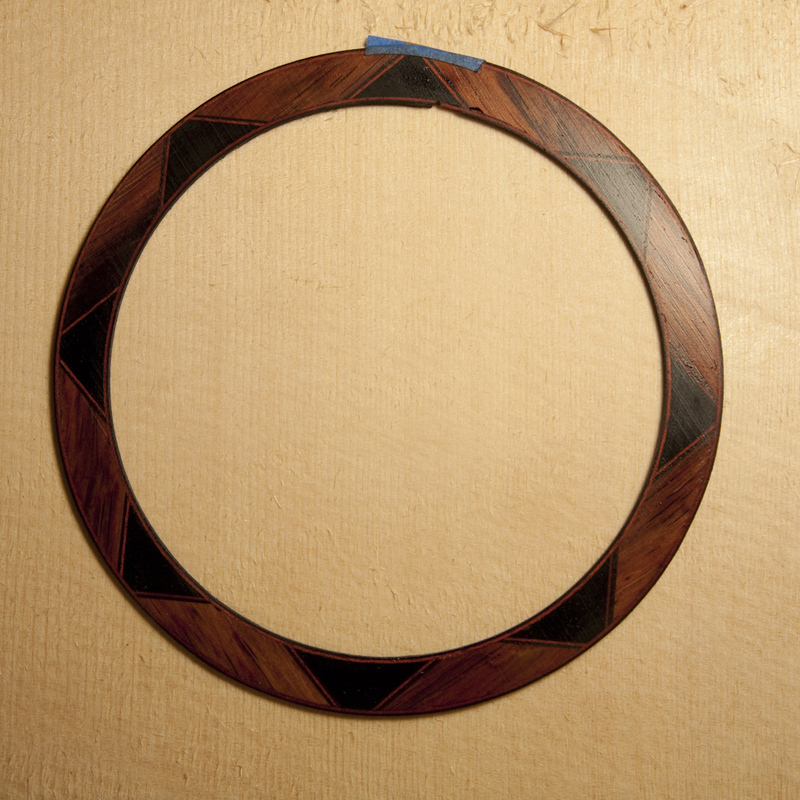 I have been making good progress on my Cocobolo JR larger acoustic. 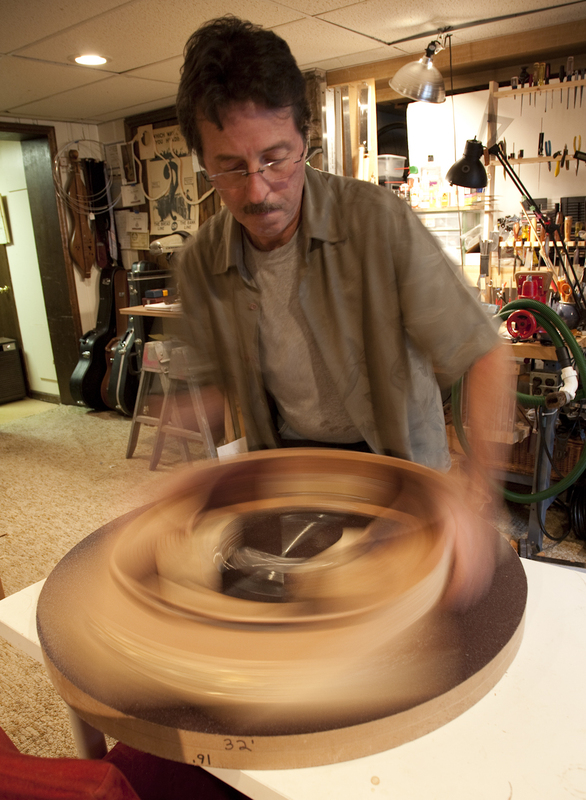 I got the sides bent which went flawlessly, the wood took beautifully to bending and holds it shape remarkably well out of the form. 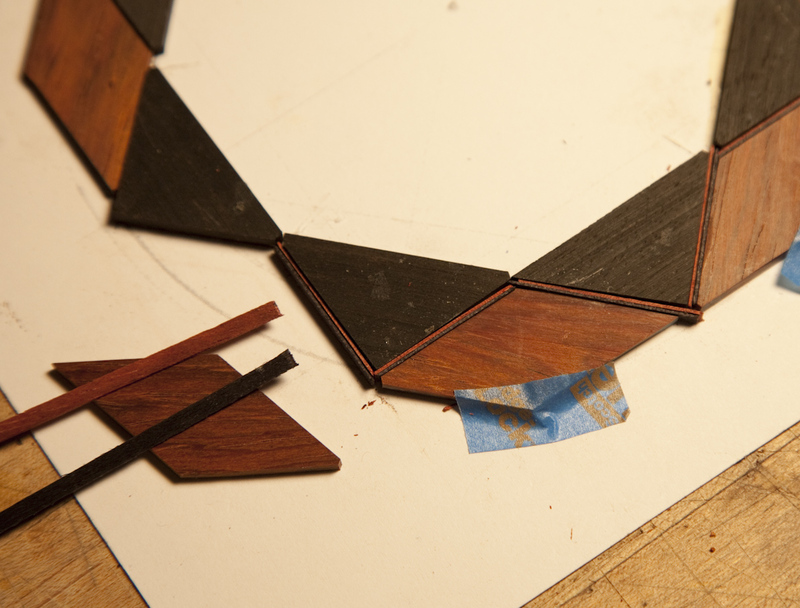 Cocobolo is so oily though that the wood darkened quite a bit when bent but after another scraping it will come back to its beautiful red/orange color. 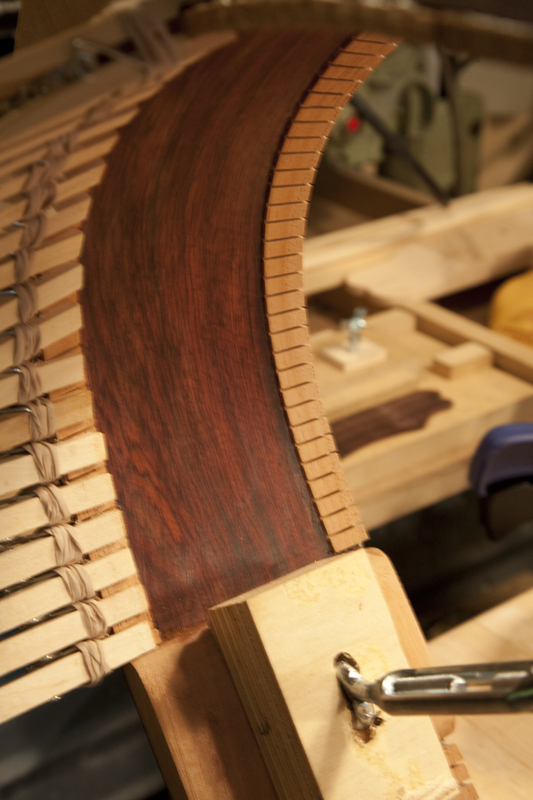 I also made the headblock out of a beautiful piece of mahogany and made the tail block as well. Those were installed and I have also completed the installation of the kerfing and raduised the top and back in preperation for the back and soundboard attachment. 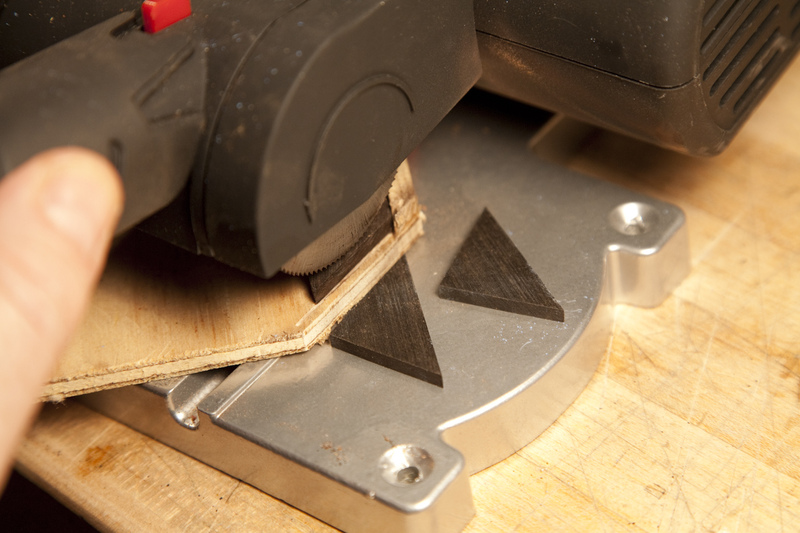 The kerfing is so critical to a build. No place sloppy job here. 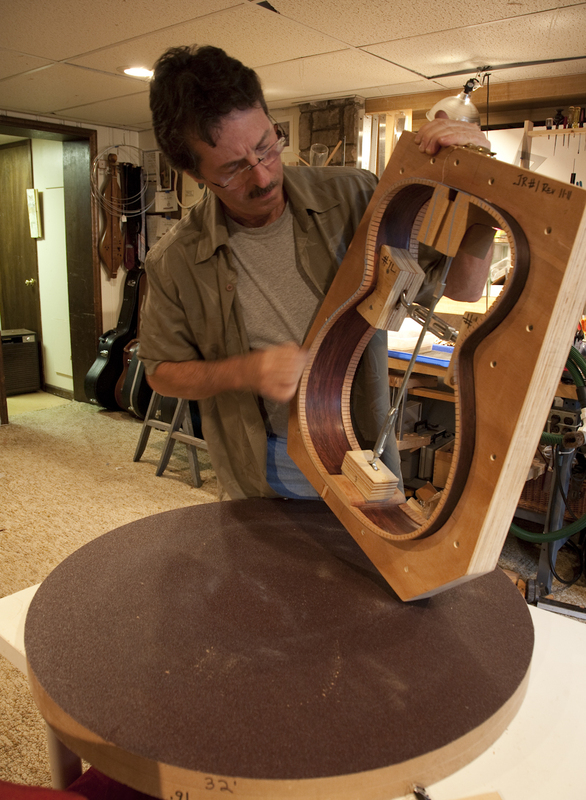 Although inside the instrument and out of sight they should still be installed tight and clean with no glue squeeze out. 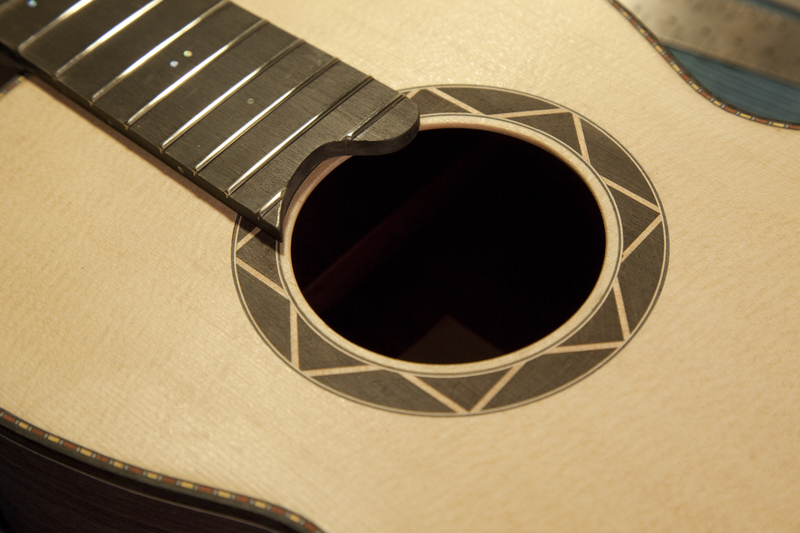 Again those little details that make a nice guitar. 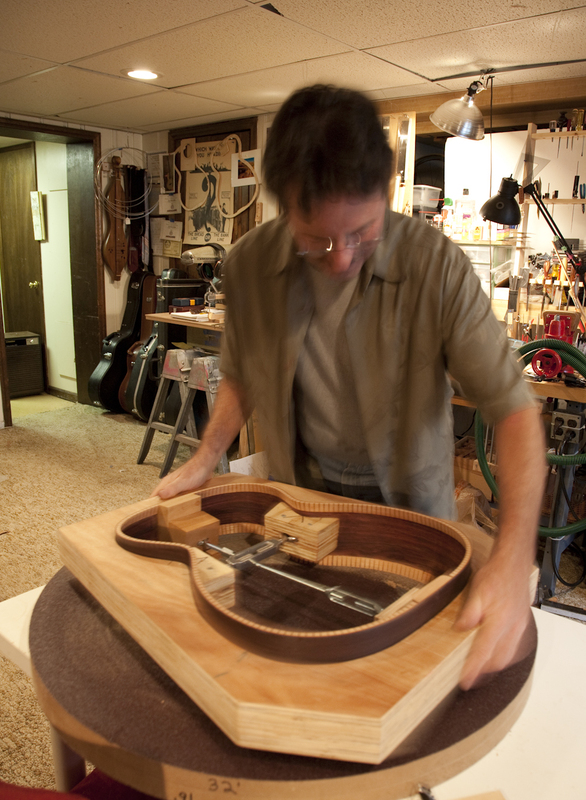 To make a guitar, any guitar, small, large custom or simple requires lots of little steps. 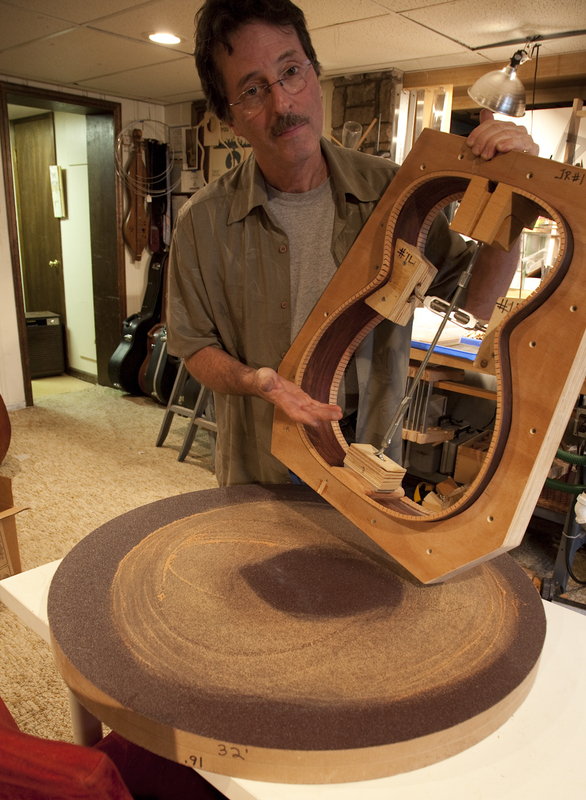 Many processes along the way, the little things that in the end add up to a finished instrument. 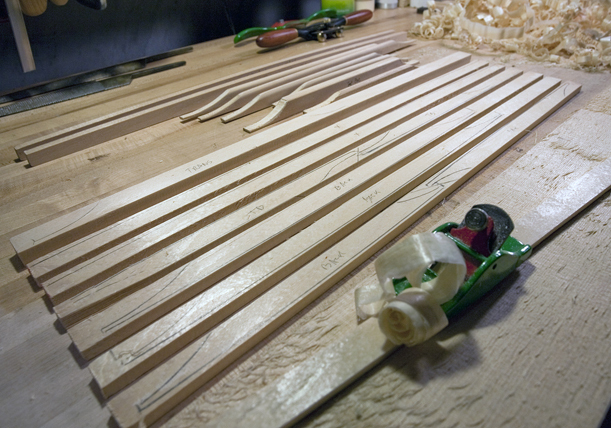 This week It began by marking up and making a set of braces. I like to use templates in this process. 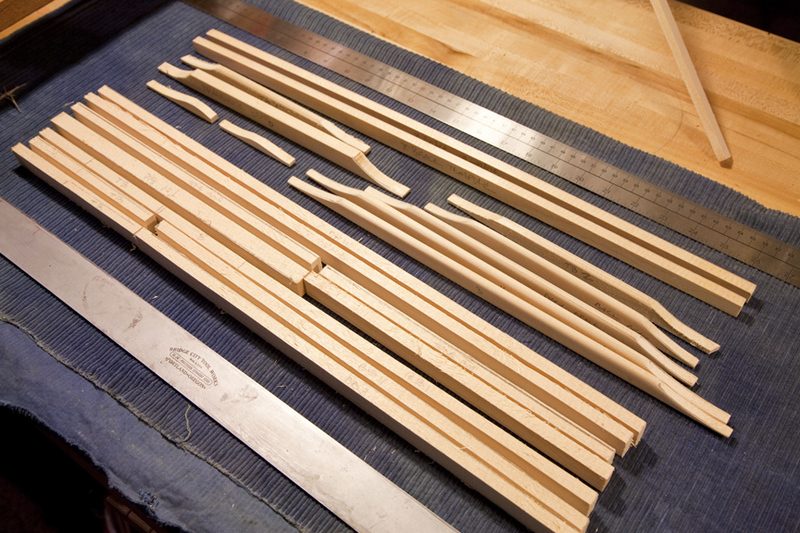 I have a set of braces completely made for each of the instrument styles I build. 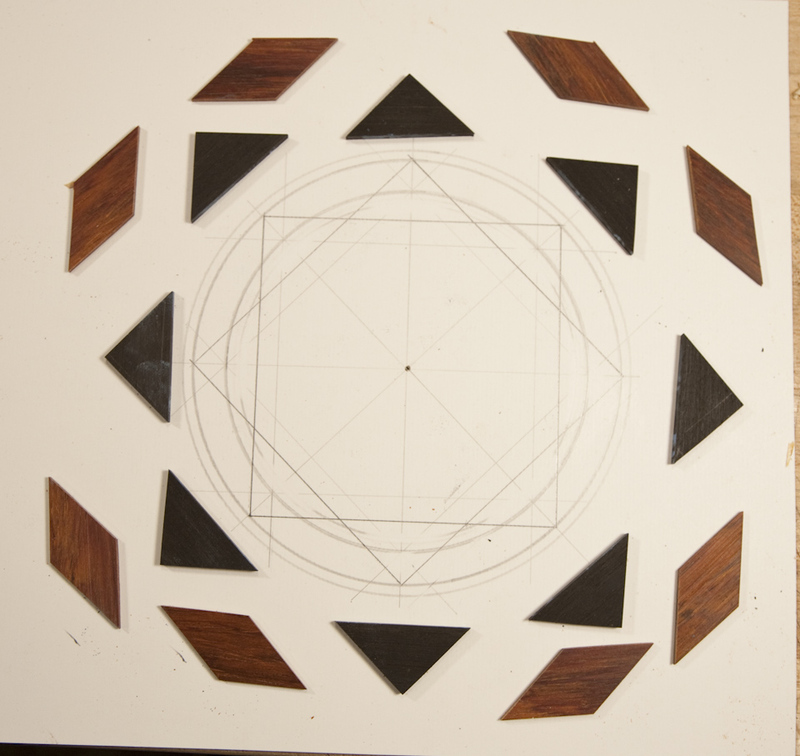 In the photos here you will see a completed set in the background and the marked up pieces of spruce in the foreground. 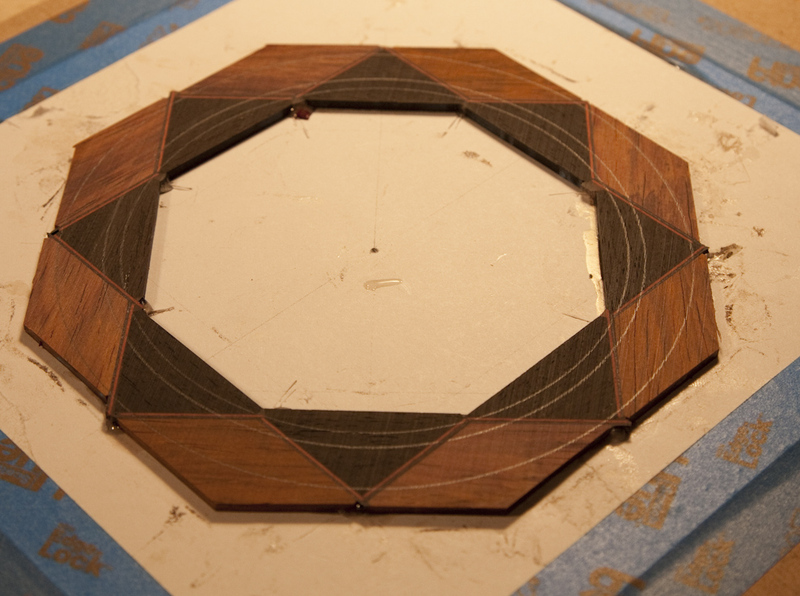 The template braces have the proper radius for the instrument being built. 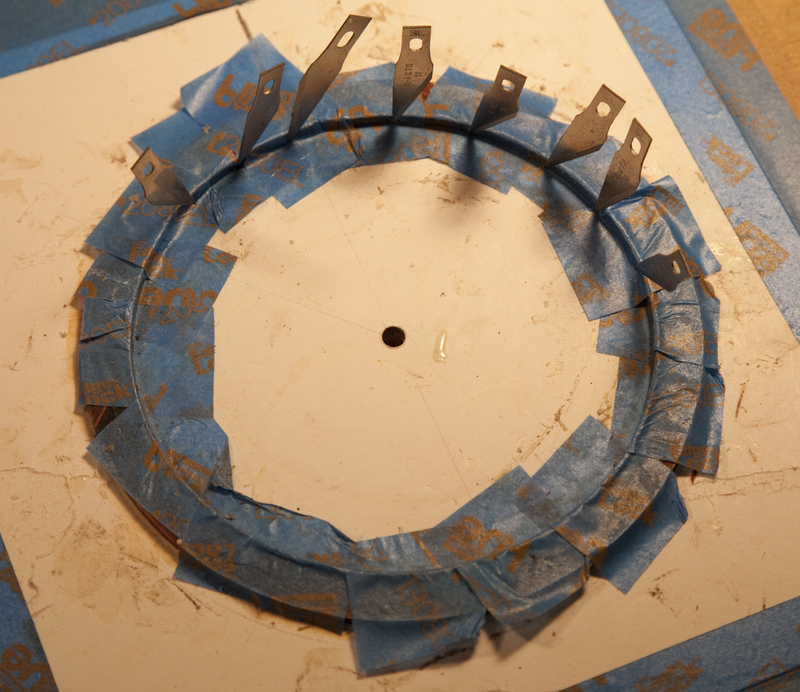 It is a simple step of tracing the braces onto my blanks and a complicated step of re-shaping and duplicating that radius by hand. 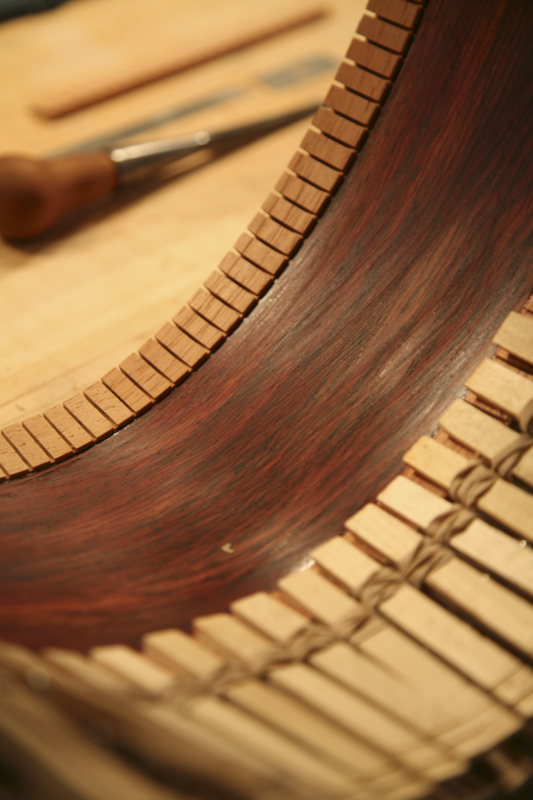 I do the final scalloping after they are glued to the top or back, but having the basic shape gives me some guidance as to where I want to wind up. 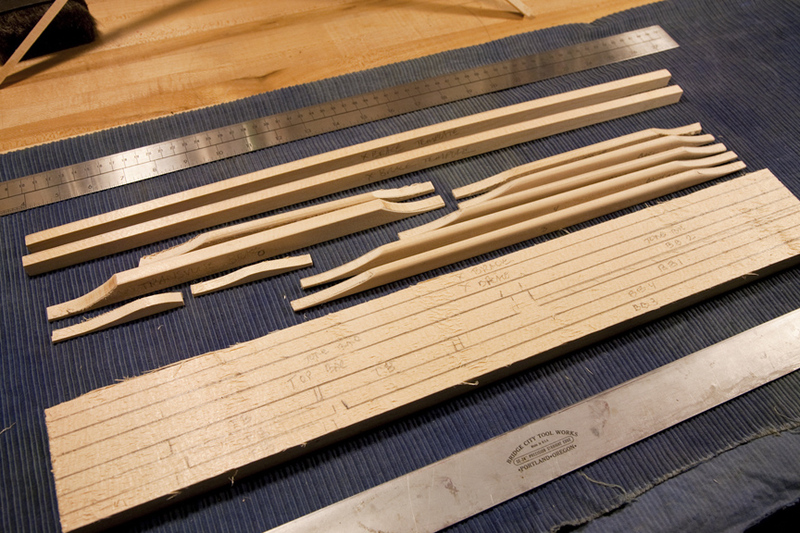 After cutting the brace blanks from a piece of stock with my band saw, I draw the outlines of each brace required. 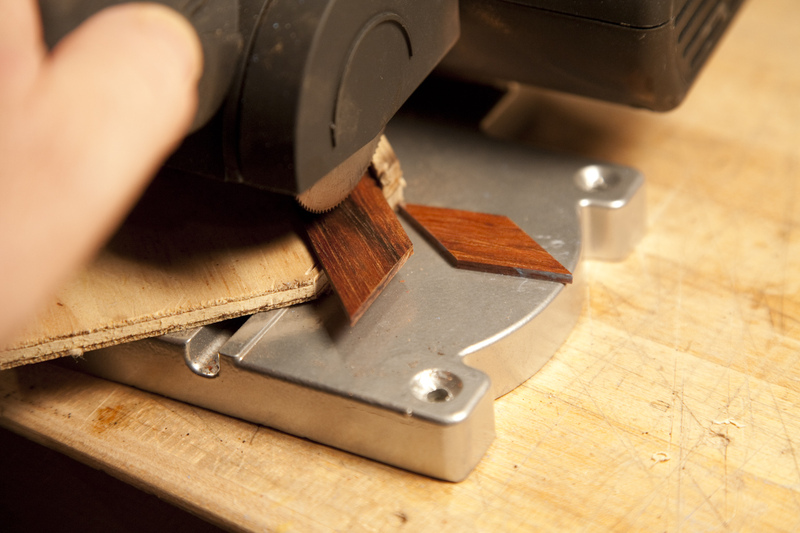 Then the braces are thinned by hand with a small finger plane and radiused . 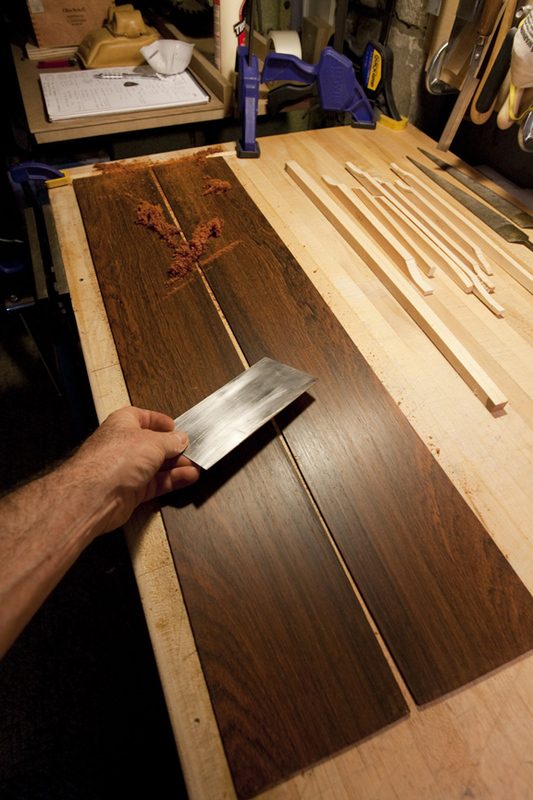 In another part of the process guitars I profiled some cocobolo sides and thicknessed them. 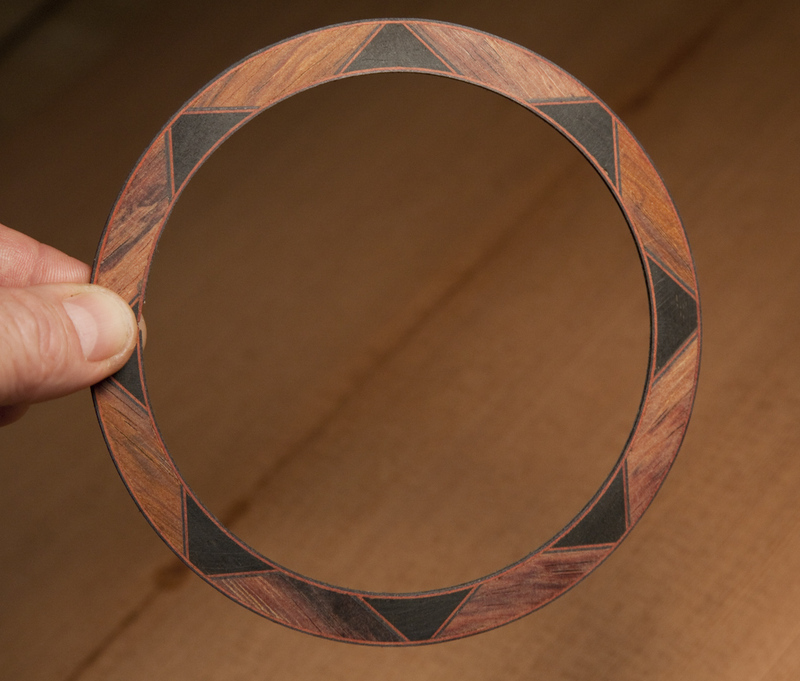 These Cocobolo sides are stiff but seem to get flexible around .079″ inches. 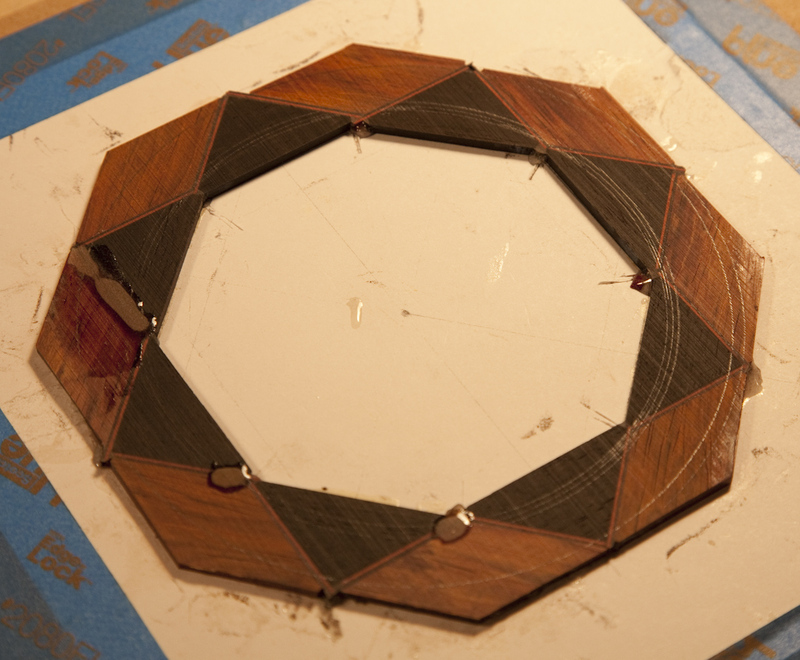 Scraping the sides smooth before I bend them saves a lot of work later. Just another one of those little things.